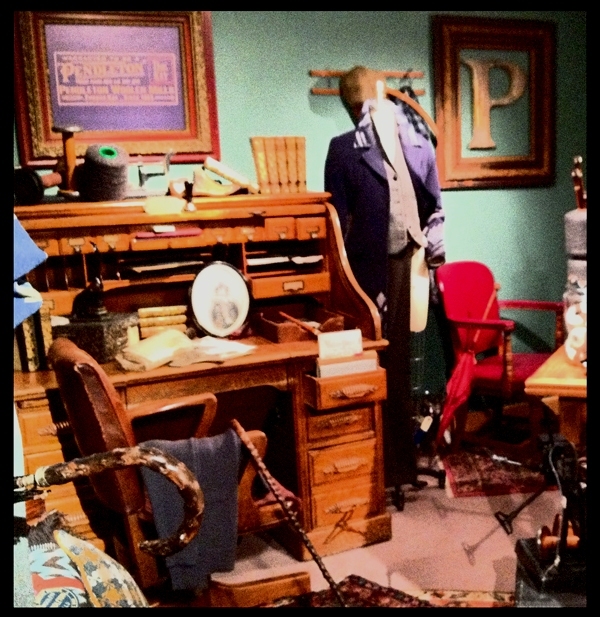 Through February 28th, Pendleton’s history is on display at the Oregon Historical Society. This beautiful building on Portland’s South Park Blocks is very near Portland State University and the Portland Art Museum. Sounds like a great day downtown, doesn’t it? The exhibit is a fun way to learn just how Pendleton is woven into Oregon’s history. The desk on display was an old oak roll-top from our corporate headquarters. It was reserved for use by the mill manager when he made his way to Portland from Washougal. Our current manager may have opened a laptop on it a time or two, but times have changed and the desk sat unused for decades. As we approached the 150th anniversary of the opening of Thomas Kay’s mill, our visual manager, Shelley Prael, decided to incorporate the desk into a display at a sales meeting. When she opened the drawers, she found them full of items belonging to Thomas Kay’s nephew, C.P. Bishop, who used the desk in the old Bishop’s store in Salem. Numerous treasures, including his college yearbooks, journal and eyeglasses, were accessioned into our archives. But don’t worry, some are on loan to the exhibit, along with other artifacts and a timeline that takes you from 1863 to the present.